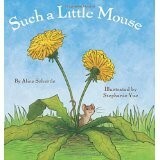 Mice are so cute and friendly in picture books! This nameless little mouse that lives way out in the middle of the meadow under a clump of dandelions is great fun to follow on his daily travels. With little text, but great rhythm, we journey through the seasons watching him put away food for the winter. Preschoolers and grade one readers will love the short phrases and sentences as well as the action of their new little friend. The repetition of the one, two, three things he does in the morning will help children practice counting and giggling. Beautiful, realistic watercolor pictures introduce children to the sights and neighbors in the meadow. Stephanie Yue’s cover in particular is fantastic. She not only shows the main character but clearly illustrates the title by placing this tiny mouse under some seemingly giant dandelions. Literacy skills such as comparing and contrasting, sequential order, main idea and supporting details plus picture clues can easily be strengthened just by sharing the picture book and visiting about it. Librarians, teachers, parents, and most importantly, children will find this story charming over and over again. 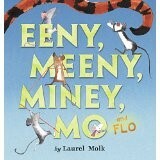 Familiar rhymes and lots of good times make up this story about four delightful mice. Long o is the sound and catching various animals by the toe is the game. Problem is, not all of the animals even have toes. The mice are active, adventurous and set to fulfill their task. Throughout the story, the littlest mouse wants to go along and have a part, but the bigger ones say, no. Suddenly when the little one seems to be gone, maybe even swallowed by an alligator, the story takes an interesting turn. Preschoolers as well as grade one readers and grade two readers will love repeating this story over and over for it humor as well as its rhymes. Teachers and parents can use this book to practice various literacy skills. Everyone will hope Laurel is hard at work on another book about this crew! Title: Eeny, Meeny, Miney, Mo and Flo!